​You just have to preorder it over the phone, by calling Adorama at 800-223-2500. 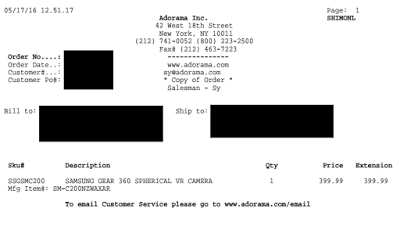 Adorama is preselling the Gear 360 at $399.99, which is more than the ~$350 MSRP in Korea, and more than the ~$360 price at MobileFun, but Adorama’s rep said they would match the price if it turns out to be lower, and if it turns out to be higher, they will honor the $399.99 price. They do require a refundable $100 deposit, but you can cancel the preorder anytime before it ships (you should still confirm to be sure). Samsung Gear 360: Overheating Issues?